The arrival of insurance reimbursement for CT screening should speed its expansion in the United States. The Centers for Medicare & Medicaid Services (CMS) proposed coverage of low-dose CT (LDCT) lung cancer screening for certain Medicare patients in November. The final rule has not yet been issued, but Medicare approval is the most recent step in an ongoing journey to expand lung cancer screening. The disease was projected to kill almost 160,000 people—representing more than one-fourth of all cancer deaths—in 2014. After decades where clinical studies failed to show a clear mortality benefit to screening—first with X-ray and then with CT—results from the National Lung Screening Trial (NLST) provided the data that started the shift. In 2011, the US Preventive Services Task Force (USPSTF) issued a B recommendation in favor of LDCT screening for high-risk current and former smokers. The USPSTF recommendation covers smokers and those who have stopped smoking within the last 15 years, who are 55 to 80 years of age with a minimum 30 pack-year smoking history, and are willing and able to undergo treatment for lung cancer. LDCT screening is slowly gaining momentum as awareness among the community increases and third-party payer coverage ramps up. Ella Kazerooni, MD, MS, FACR, chair of the ACR's Lung Cancer Screening Committee, makes clear that the only test that has ever been proven to reduce lung cancer mortality is to screen with low-dose chest CT.
"The research has primarily been done over the last 15 years to validate this as a screening test and it culminated with an eight-year multicenter study funded by the NIH [National Institutes of Health] of over 50,000 people and $200 million," Kazerooni says. "It was performed at 33 different sites, both academic and private practice based across the US, and in the fall of 2011, the results were released that showed it met its mortality endpoint, which is it reduces the lung cancer death rate by 20%." Subsequent formal data have shown that lung cancer screening is also cost effective, even when compared with tests such as colonoscopies and mammography. With screening reimbursement for patients who meet the lung cancer risk criteria coming online, such programs will expand. Eli F. Dweck, MD, chairman of the department of radiology at Aria Health in Northeast Philadelphia, notes that just like anything new that comes on the scene, the screening will take some time to gain momentum. "The original literature started hitting the journals five to seven years ago, but in the last couple of years, and increasing each ensuing year, the [increase in] the literature [showing acceptance of the] benefits of lung cancer screening has become mainstream," Dweck says. "I expect it to be an area of growth going forward." Ritu Gill, MD, MPH, an associate radiologist at Brigham and Women's Hospital (BWH), and Francine L. Jacobson, MD, MPH, director of lung cancer screening at BWH in Boston, say that institution's lung cancer program is seeing a gradual increase in the number of people being referred for screening every month since the program was instituted. They were interviewed before CMS proposed screening for eligible Medicare patients. 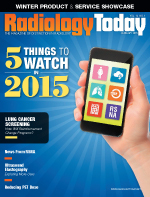 "There is an increasing trend to screen with CT scans rather than radiographs," Gill says. "This is largely due to the findings from the NLST study." Radiography studies did not show a mortality benefit to screening. "Early lung cancer may not be seen by radiographic technique and lesions less than 1 cm may not be visible on radiographs," Jacobson says. "Moreover the part-solid or ground-glass lesions can easily be missed on radiographs as they are not dense enough to be visualized on X-rays." She added that dedicated lung cancer screening using low-dose protocols and structured reporting allows for a comprehensive screen by CT scans. The lack of broad insurance reimbursement has been the chief hindrance to the expansion of lung cancer screening. That is changing as both Medicare and insurance regulated by the Affordable Care Act begin to offer coverage for people at high risk for lung cancer. The Affordable Care Act requires that any screening exam that receives Grade A or B recommendation by the USPSTF must be included as a covered benefit. Third-party payers are now required to cover lung cancer screening with CT services. The mandate became effective on January 1 of this year. Lobbying by many in the health care community paid off when Medicare announced its proposal to cover lung cancer screening in November. Once the final rule is published and implemented, CMS will cover patients between the ages of 55 and 74 who are asymptomatic with no signs or symptoms of lung disease, have a tobacco smoking history of at least 30 pack-years, and either smoke currently or have quit within the past 15 years. The proposed rule also requires radiologists reading the exams to be board-certified, accredited, and experienced in lung cancer screening interpretation. Finally the scans must deliver no more than 1.5 mSv of radiation. The ACR put together a letter that 76 professional groups signed on to in favor of lung cancer screening, outlining why it should be done and how it can be done safely and affectively to minimize harms and maximize benefits. The college responded quickly to the CMS coverage decision. "We strongly advise older current and former heavy smokers to speak with their doctors about whether CT lung cancer screening is right for them," Kazerooni said via press release the day CMS announced its coverage proposal. "If they and their doctor decide that screening is warranted, we encourage patients to seek out an ACR lung cancer screening center." As reimbursement comes online and patients become aware of coverage, screening programs will need to accommodate those patients. Gill says primary care physicians are important partners in providing screening service and smoking cessation counseling. She believes those physicians can prove instrumental in steering the right patients toward screening and efforts to quit smoking. She adds that there is a need to have screening programs available at large community centers. "A successful screening program is best embedded in the community practice setting with an outreach and backup support from the academic centers," Gill says. "This support is key is in the initial ramp-up to have the required infrastructure up and running and the much-needed training for the radiologists and technologists and counseling for the participants. At BWH we have a screening program in place and Dr. Jacobson has been instrumental in getting this off the ground and continues to provide the much-needed support as we transition into the next phase." The ACR and the Lung Cancer Alliance have taken leadership roles in creating systems responsible for lung cancer screening by CT and organizing the voices of many professional and other interested societies. The USPSTF recommendation most closely follows their recommendations, although the American Association for Thoracic Surgery strongly believes in dropping the "quit rule," which recommends halting screening after 15 years of smoking cessation. The society has launched an online multiple model risk assessment calculator to help patients and professionals begin considering secondary risk factors. While lung cancer screening support is widespread, exactly which population should be screened remains a debated topic. "[Screening] has the proven capacity to find early lung cancer in smokers, resulting in surgical cures," says Norm Thomson, MD, MBA, section chief of general radiology at Georgia Regents Medical Center. "Whether the benefits exceed the potential harms of false-positive exams, the anxiety and discomfort of diagnostic testing, and the risks of invasive tests and cancer treatment is a controversial topic being debated in medicine." Therese Bevers, MD, FAAFP, a professor of clinical cancer prevention and the medical director of the Cancer Prevention Center and prevention outreach programs at MD Anderson Cancer Center in Houston, says more individuals are now going to want to take advantage of screening as insurance coverage reduces the out-of-pocket costs, which commonly range up to $400. That expansion raises concerns about false-positives. While the public always hears about the benefits of cancer screening, Bevers says very little is mentioned about the possible harms associated with cancer screening. "One of the most common harms with cancer screening is false-positives," Bevers says. "That's where something is found on a screening test and you go through some kind of workup to find out it's not cancer. It's an entity that if you hadn't done the screening, you would have never known it was there, you would never have had to go up for all that workup and possible biopsy." An estimated one scan in four will find some lesion, Bevers notes, but 85% of those are going to be a false-positive. Whether this false-positive rate is balanced by the benefits being obtained in a high-risk population continues to be debated. For example, a recent study surveying NLST more than 2,800 patients suggests that patient concerns and anxiety about screening is short-lived at best. The study done by researchers at Brown University reported no significant difference in anxiety or quality of life one month and six months after a false positive. "I think there are significant benefits for those who meet the NLST criteria and I recommend it," Bevers says. "I appreciate that there are harms and I think the individual should understand those harms, but if they understand the door you are opening and they agree to that, I think the benefits are huge in this high-risk population." "Relevant patient advocates and cancer groups are overwhelmingly satisfied that the scientific evidence supports screening those at high risk for the disease," Laurie Fenton Ambrose, president and CEO of the Lung Cancer Alliance, says. "We are fully capable of balancing the benefits and risks." As screening expands, it will likely evolve. Having more patients involved should improve data and perhaps refine the appropriate screening audience. Likewise, other tests—particularly breath, blood, and urine—may provide lung cancer biomarkers that will help better define the right population to be screened in the future. Part of that expansion includes ending a stigma of sorts surrounding lung cancer. Because lung cancer is heavily linked to smoking, some may blame the person for their disease; this is not the case with other cancers. Jacobson includes a slide in her presentations thanking those who have smoked for participating in the studies that proved early detection can change outcomes. "Getting it out of the closet and continuing to identify the smaller risks that in combination lead to the 20% of lung cancer in lifetime nonsmokers over the coming years will allow appropriate expansion of screening," Jacobson says.